Local authorities and waste contractors should expect to see increases in landfill gate fees in future years as available landfill capacity reduces, says WRAP’s annual gate fee report. Now in its eleventh year, the report summarised gate fees charged to local authorities in the UK for a range of municipal waste recycling, recovery, treatment and disposal options. Its aim is to increase price transparency and improve efficiency in the market. The survey targeted local authorities, private sector operators and senior managers of large waste management companies operating within the UK market within the 2017 calendar year. Open air windrow, wood waste recycling and recovery and residual waste treatment processes such as Mechanical Biological Treatment (MBT) and refuse-derived fuel (RDF) was not included. Some commercial gate fees have also been provided by organic waste treatment facilities. The upward trend in MRF gate fees reported last year has continued, with the median MRF gate fee for contracts sorting four or more materials at £22/tonne, compared to £15/tonne last year. A total of 75 local authorities (64%) reported a change in MRF gate fee in 2017, with 35 of those being an increase in gate fee. Companies interviewed report that MRF gate fees currently (Q4 2017 - Q1 2018) are higher than the survey median, typically £35/tonne reflecting the current survey’s reported gate fees for new contracts following Chinese import restrictions. The median ICV gate fee for all types of municipal feedstock being sent to facilities has had a £3 increase since last year to £46/tonne. Mixed food and green waste, the most common feedstock sent to IVC, has also increased by £3/tonne to £49/tonne. A downward trend in AD gate fees has continued, with the median fee now at £26/tonne, a crease of £3/tonne from last year’s figures. In many parts of the UK, historic prices paid by local authorities do not reflect the fall in current commercial pricing, the report said. Median gate fees for EfW facilities were dependent on the year they were built. For pre-2000 facilities, the median fee was £57/tonne compared to £56/tonne last year. Post-2000 facilities charged a median fee of £86/tonne, an increase of £3/tonne from last year’s figures. Some commercial prices of £90-£100/tonne were reported depending on local competitive position. 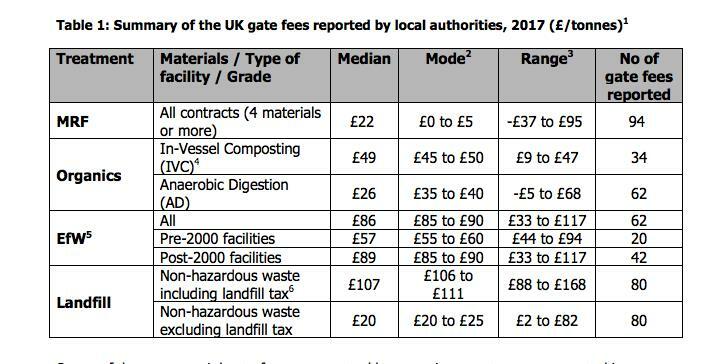 Following last year’s increase, UK gate fees have taken a slight decrease to £20/tonne-exclusive of landfill tax. Fees range across the UK from £2 to £82/tonne as landfill gate fees vary depending on alternative faculties such as EFW or ports for RDF export.